I can't be the only one who buys up 10¢ packages of Easter egg dye after the holiday right? I get it mostly because we use it on tissue paper. We fold it and dip dye it to create soft geometric patterns. I had some feathers I wanted to dye, and noticed the Easter egg dye package. So I decided to try that first before getting into more serious dyes. This method will also work with Kool-aid and food coloring. So if you don't have Easter egg dye, you can use those. Feathers with light colors. The not pink ones in my photo are the natural feathers. 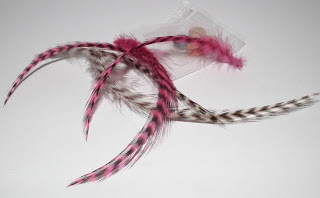 These are not super long feathers, but it will work with those as well. These are from my stash of feathers. For your feathers, you'll want a dish they won't get the shaft broken in. These little feathers are quite flexible so I just used a coffee mug. If your feathers are too long for your microwave, well.. I want pictures when you're done! And I suggest a baking dish and heating it in your oven at 250 degrees F for 20 minutes instead of zapping it for 2. Most feathers can curve some without breaking the shaft, so if they aren't expensive feathers, try a casserole dish first. Wash your feathers. This gets any oil off of them and off your fingers so the oil won't block the dye. I used a few drops of dish soap and warm water. I agitated them just a bit with my fingers and let them soak for 5 minutes, then rinsed them well. Now, put your feathers, which will look limp and awful into your dish. If your feathers are small like mine, you can use 1/2 cup water and 3 Tablespoons of vinegar which is just what my Easter egg tablet instructions called for. If you're using Kool-aid or food coloring, you want to use a ratio of 2 parts water to 1 part vinegar to cover. So if it takes a cup of water in the bottom of a casserole to cover your feathers, add a 1/2 cup of vinegar. Then add your coloring. A half package of Kool-aid, 5 or 6 drops of food coloring. You don't need much unless you're doing a whole bunch of feathers. Cover the dish with plastic wrap with a couple holes in it if it's shallow so it won't boil over. I didn't because the coffee cup was deep and I'm out of plastic wrap and wanted to try it right that minute. Take it out of the microwave and let it cool. Then pull out the sorry, sad looking wet feathers and rinse them well. I used a couple more drops of dish soap to make sure the colors took well. Now, dry the feathers. If you're only doing a few like I did, they will dry while you fluff them back out with your fingers. If you did a bunch put them in a box and use a hair dryer on low. They will dry pretty quick and the box will help keep them from winding up everywhere. Re-align the feathers if it's necessary. So that's a fast, safe way to color feathers for hats, hair clips, earrings and even feather extensions. The feathers in Turnip Girl's hair were colored with food coloring. This photo was taken after she shampooed her hair with the feathers in it. 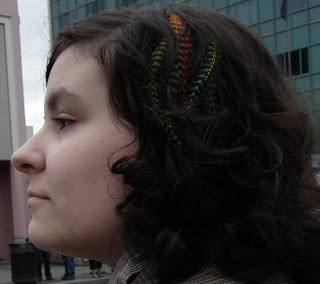 A word on feather extensions- I live in an area with a lot of fisherman, and a lot of them are fairly annoyed that suddenly some of their favorite feathers are a lot pricier because of the trend. But at the same time, if you have a few friends who fish, and you just want a few long feathers, you might be able to ask them rather than buying more than you need at a place that specializes in fly-tying equipment and supplies. You can also ask friends who have turkeys or roosters for feathers that are shed naturally. If you have shorter hair, then you can use shorter feathers. I plan to put feather extensions in my daughter's hair, but instead of using the very popular grizzly feathers, I'm going to make them with peacock herl. Her hair is just at shoulder length at it's longest part and shorter most other places. For myself, well.. I'm not sure I can find feathers long enough, and planned to use ribbons and beads, possibly with the short feathers above on the ends of the ribbons. How long does the color last on the feathers? It's still intact on the feathers we used. It's pretty stable once you clean off the excess, but if you're using the feathers on clothing or accessories, I'd suggest gentle cleaning methods.